Germany – Prolight & Sound sees Alcons Audio previewing two new products for the first time, as well hosting an off-site demonstration and observing its annual tradition of showing its latest development ideas and studies, marking the direction that Alcons product portfolio will be heading in the foreseeable future. 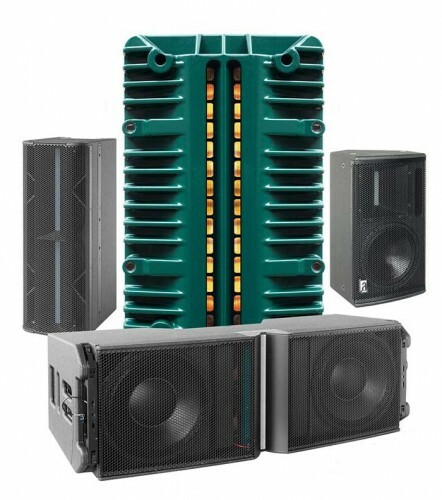 The new products being previewed are a wide-dispersion version of the LR28 larger format line array and an extension of the QR24 series, the company’s modular high-output line-source column. In a development which will be of interest to larger live productions and festivals, the 110º horizontal dispersion LR28/110 is designed as an extension of the existing three-way, 80º dispersion LR28/80. Featuring the same faceprint downfill and components (two 14” woofers, four 6.5” midrange and a RBN1402rsr pro-ribbon driver) on a 110º waveguide, the LR28/110 is powered and controlled by four channels of the Sentinel10 amplified loudspeaker controller. Like the LR28/80, it has a rigging system that enables angle-setting on the cabinets without lifting the array, resulting in safer and faster set-up with minimal handling. Alcons is also showing its new extension of the QR24 series modular high-output line-source column. Designed for acoustically challenging venues, the QR24 delivers high output and razor sharp dispersion control, without the need for active beam steering. Another highlight of Alcons presence at Prolight+Sound 2017 will be an off-site demonstration of the LR18 line array, RR12 point source array and QR24. This takes place on Wednesday 5th April, with further details provided to those who register on Alcons stand B50 in Hall 3.1. Alcons will also be showing a wider selection of its point source, point source array, line source column and line array solutions as well as new designs on the stand, with staff available to discuss the company’s solutions and answer any questions. Prolight+Sound takes place at Frankfurt Messe from 4th - 7th April 2017.